Ah. This is a good one. In this session Shari Thurow (@sharithurow, Founder and SEO Director at Omni Marketing Interactive) will be showing us how to create search engine friendly sites that can be read and indexed by search spiders, but are also equally appealing to human visitors. A great resource for those dealing with, ahem, I mean… highly respecting the feedback of web designers who aren’t convinced you can have SEO friendly web design without compromising user experience. Yay for SEO and UX working together, and yay for educating entire teams on the value of both! Let’s go. About Shari Thurow – She’s the (wo)man when it comes to SE friendly design. Been doing this since 1995. She is a designer and a developer; good technical resource. Web usability and UX professional since 2002. All of the recommendations is this presentation are based on data! When you are UX testing a website you’re not testing the person, you’re testing the website. The Mayo Clinic is a site that does extraordinarily well in regards to SE friendly web design. 2) SE Friendly design is NOT designing just for obtaining SERP ranking. Don’t want to focus on technology-centered design. 5) How you place words and graphic images on your website – how you physically arrange things – tells SEs what you think is important. If it’s important SEs assume you’ll put it higher up on your page. Google is not going to like you; Google is not going to subscribe to your newsletter; Google is not going to add a pair of ski Googles to cart. Google and Yahoo and Bing are trying to figure out what searchers want and give it to them; so YOU have to figure out what they (the humans) want and give it to them, too. 5 Rules of web design: Make It…. 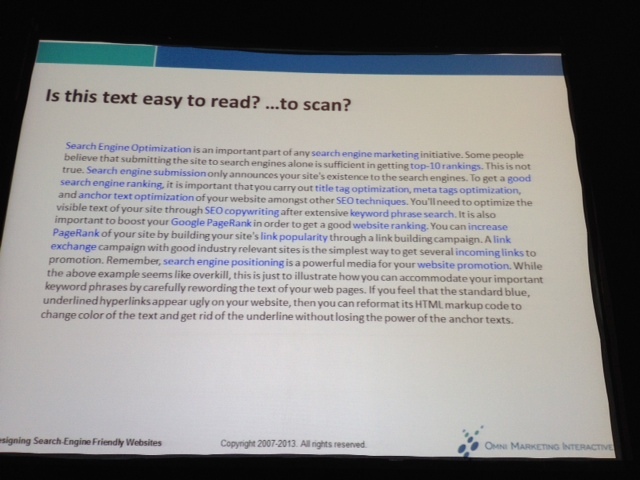 Content needs to be easy to read, and easier to scan. TEST! Is this easy to read? Be careful about using Grey. A lot of people don’t recognize grey as clickable. Don’t format your clickable and nonclickable text to look alike. This is a bad user experience and for SEs this looks like spam. 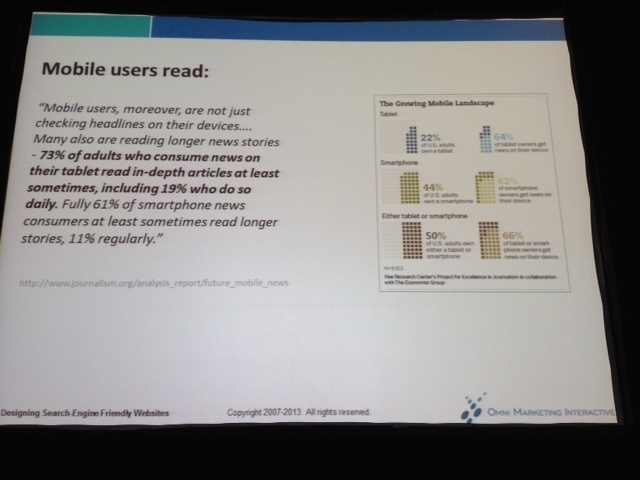 (People scan before they read; can humans understand your content as well as technology?) All clickable text should look clickable, all not clickable text should look NOT clickable. Easy to navigate answers the questions: Where am I? Where can I go? How Can I get there? Make it easy for people to decide which link to click on. Apple Germany and Apple UK = really good examples of navigations that rock. 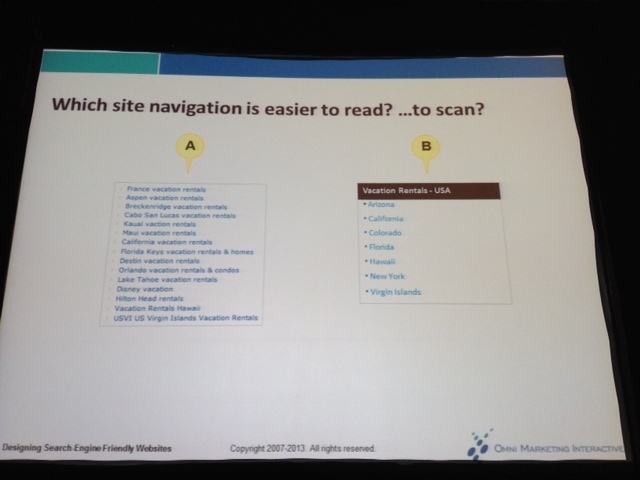 TEST: Which site navigation is easier to read? Expanding and collapsing navigations (The ones that show the + and – sign) are the WORST for Search Engines). Flyout menus have the most errors; dropdown menus tend to have the least amount of errors. MegaMenus tend to lose up to 20% revenue! If you NEED to do a MegaMenu, the FoodNetwork has a good example that is SE friendly and user friendly. If you give people too FEW choices, it ticks off users. But if you give them too MANY choices, they are also ticked off because they don’t know where to begin. You want something in between; that “in between” you will feel out with testing. If a site navigation scheme is NOT search engine friendly should you not use it? NO! USER EXPERIENCE FIRST! 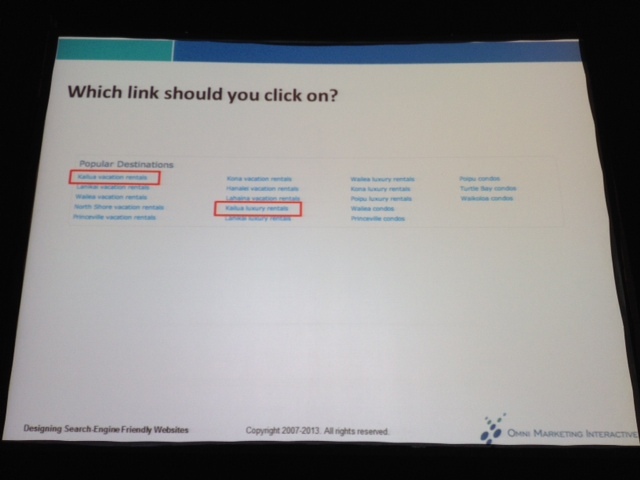 If your users like to use the navigation, use it, but make sure to include text links as well. Always try to have some form of text navigation on your website. A fat footer can be really helpful WHEN DONE RIGHT. Really big websites need to have a site index as opposed to a site map. Before people can interact with your website they have to find your website. If you don’t want people to notice something, put it in the lower right hand corner of the screen. People are less likely to look down there. After arriving people don’t mind clicking through pages as long as they feel like they are making progress. 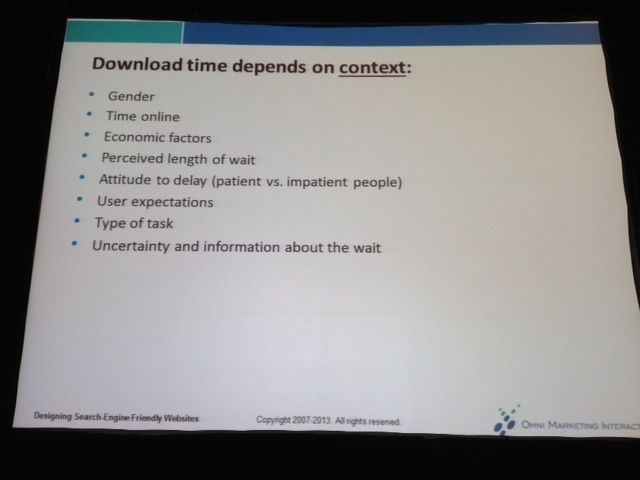 There’s actual download time and perceived download time. The latter is more important than the former. If people get their keywords validated they will regard the download time as good; if they don’t get what they want they will perceive the time as slow. 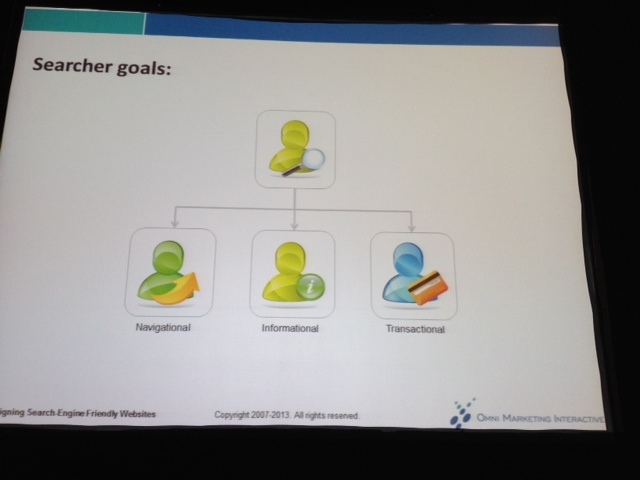 Searcher goals are HUGELY important! Does your searcher want navigational, information (63-80% of SE queries), or transactional (24-24%) queries. Shari calls these “Go, Know or Do” goals. What kind of text should you use on your website? Primary text items are more important than secondary text elements. Make sure to place keywords in your titles, visible body text, anchor text , meta tags and ALT text. Do not assume responsive design is necessarily Search Engine friendly! Websites designed for mobile have to follow the same 5 rules for web design (covered above) as desktop websites. Responsive design DOES increase the download time of a website. 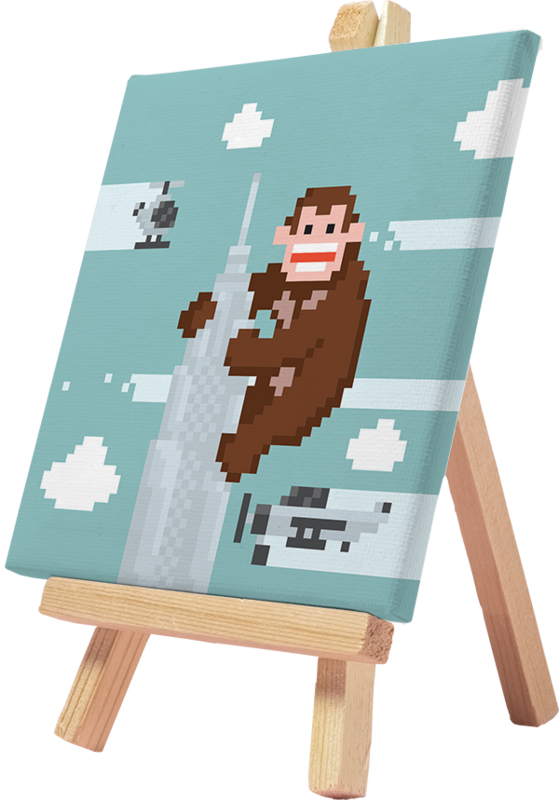 Count the numbers of images; the number of scripts – those both bog down mobile websites. Social signals and popularity are both forms of validation. 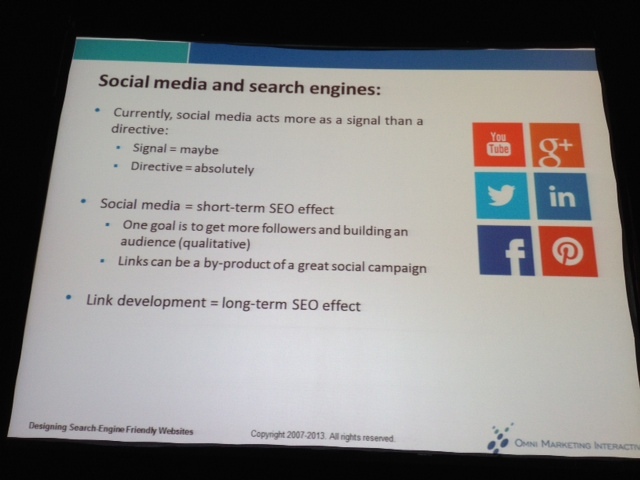 The idea is to get a quantity of quality links. When you are logged in, Search Engines remember click popularity and adjust your SERP results based on that. People tend to look three or four inches from the top of the screen; this is why the H1 is incredibly important. Generally 7-12 FAQs per page is ok; after 16 it gets really hard to scan (which is a bad user experience. 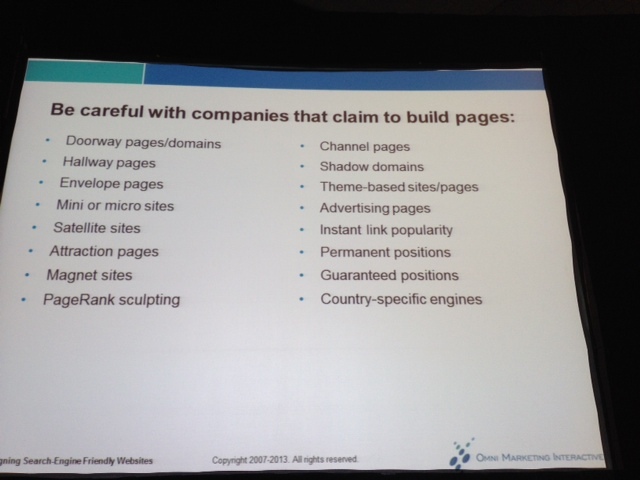 Search Engine Visibility = Shari’s book. Read it for more information on getting a PDF to rank. 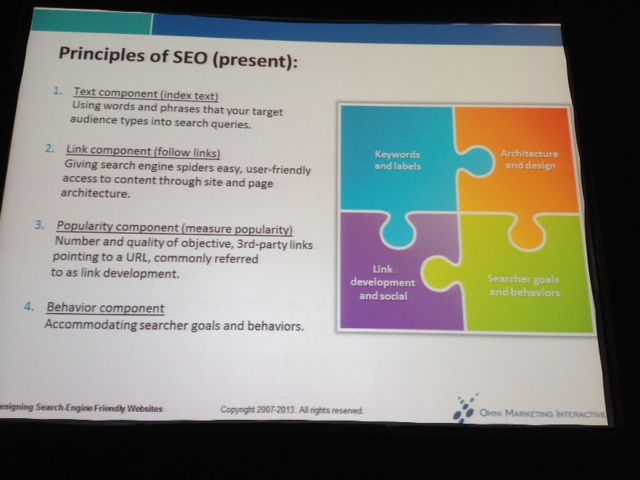 Good tips on SEO friendly web design. I have to add some points that are important to take care in designing seo friendly website – Try to avoid using flash and frames on the page and always use eye soothing colors for background and text. Good additions, Carol! Sometimes optimizers will specifically use frames if there is a portion of a website they don’t want/need crawled. but I agree — in general they should probably be avoided. Excellent points. I hope many could follow this advice. However, most of the modern techniques do use text links, so it should be ok. Best way to test it is to disable JS on the browser and see if the menu links appear. Or if it’s a website already indexed by Google, take a look at the cache version and check the “text only version”. That way we can check whether our menu shows (SEO friendly) or not (definitely not SEO friendly). Besides that, loved the advice. Good supplemental JS advice/clarification, Xanthi! Love your troubleshooting advice. One example of navigation that Shari gave that was user-friendly but needed an SEO text supplement was an interactive map of the United States; user’s loved to choose their state by clicking the colored map but (obviously) the design is bad-news-bears for SEO, so she recommended also including text links that name all the states below. Chelsea, would be interesting to get your view on the hummingbird and how it will change content marketing.